Do you need an intervention when it come to overpacking? I know I did! And over the years and through quite a few trips, I’ve read tons of articles and tips on how to pack properly. When a trip was on the horizon, I would make a list. As I’ve always been a girl who loved a list. Then, after a few trips, to save some time, I made those lists into templates. And now, I use them every time, even for a weekend getaway. Just because, you know….I don’t want to forget anything. 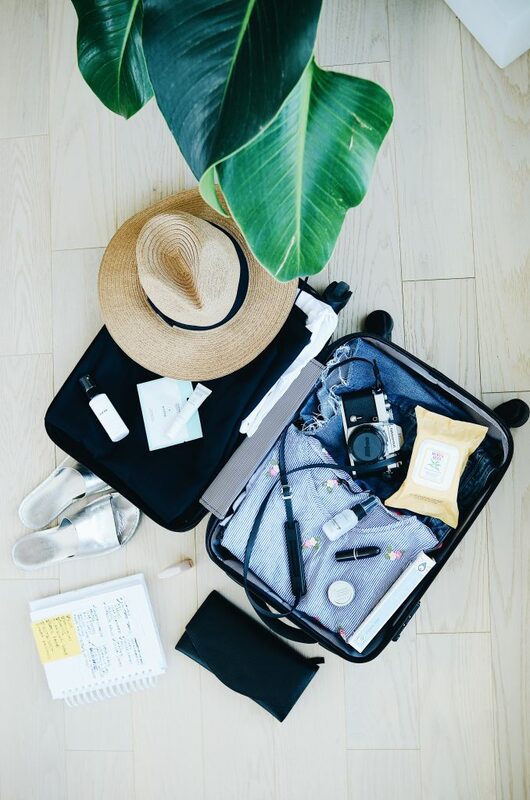 First up, is my checklist of essential items to bring, of course, this will vary depending on the location (sunny, cold, wet) and the duration of the trip. But most of the items are a constant. I’ve even left room for you to add any other personal items you may want to bring. 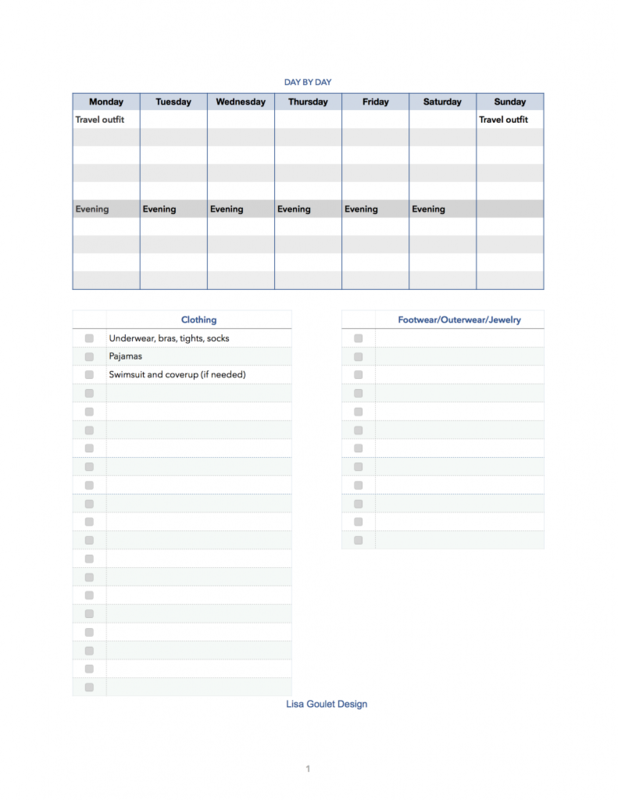 Then I use a weekly template to fill in the days I will be gone with room to add clothing for both day and evening, in case you will be changing for dinner/evening. I make sure to include shoes, outerwear and jewelry on this list. I find doing this day by day schedule really eliminates bringing a ton of extra clothes and shoes…HELLO…. as it gives you a visual of actually how many pieces/shoes you really need. Also, seeing the outfits listed out day by day helps you decide what pieces of jewelry and footwear you’ll need to bring and what can do double duty. 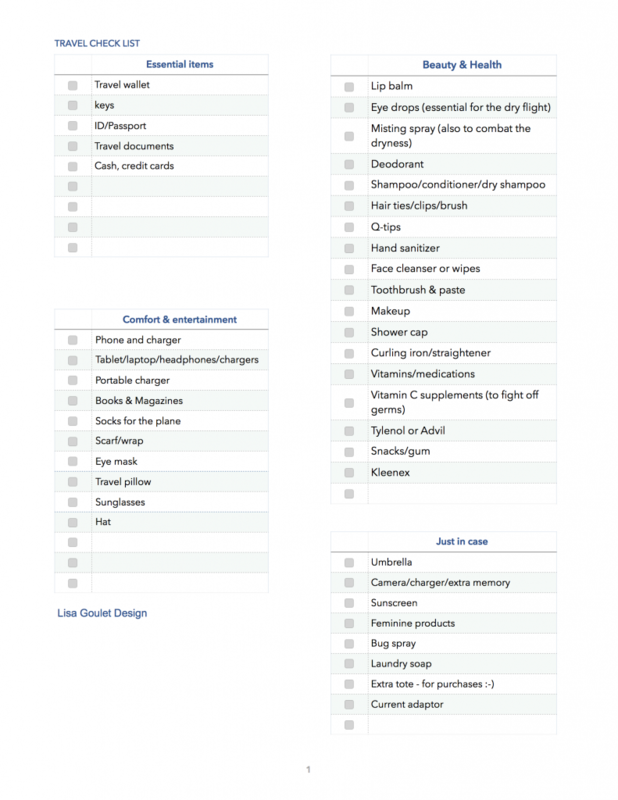 The list below the day by day template is for you to list the clothing/footwear pieces separately and then check off the items as you pack. If you want to take it up a notch, you can assign each piece of clothing a number and see how many times you are wearing that particular item. And if you are only wearing it once, perhaps it shouldn’t make the final cut. If you have any packing tips, I’d love to hear about them. I’m always looking for ways to streamline the packing process. Happy New Year! I hope you had a great holiday break and are right back at it now. I have no excuse, except laziness about not blogging, but I’m committed to getting back into it for 2018. 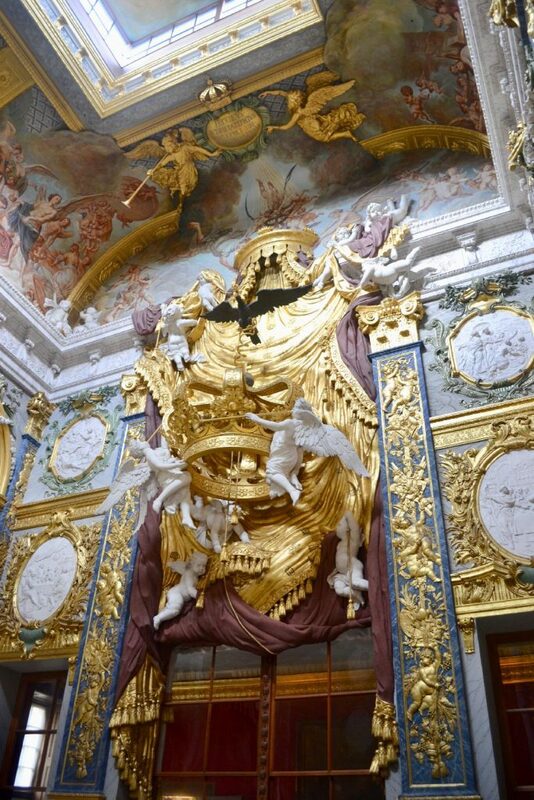 So, I’m going to finish up with my trip to Eastern Europe from the fall for my next few posts and then start back on giving you some lifestyle and design inspiration. I’m planning some rebranding and refocusing this year, so bear with me while things get cleaned and spruced up just in time for Spring. 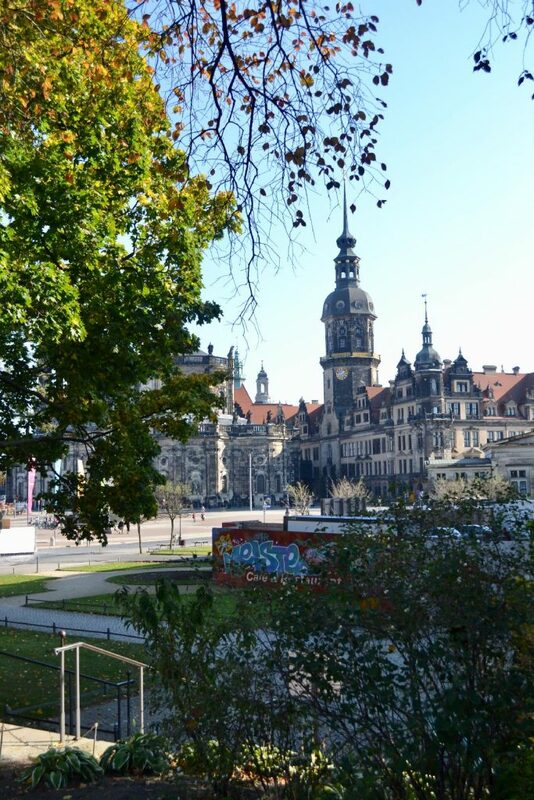 After leaving Berlin and on our way to Prague, we were up early and stopped for a few hours in Dresden, Germany. 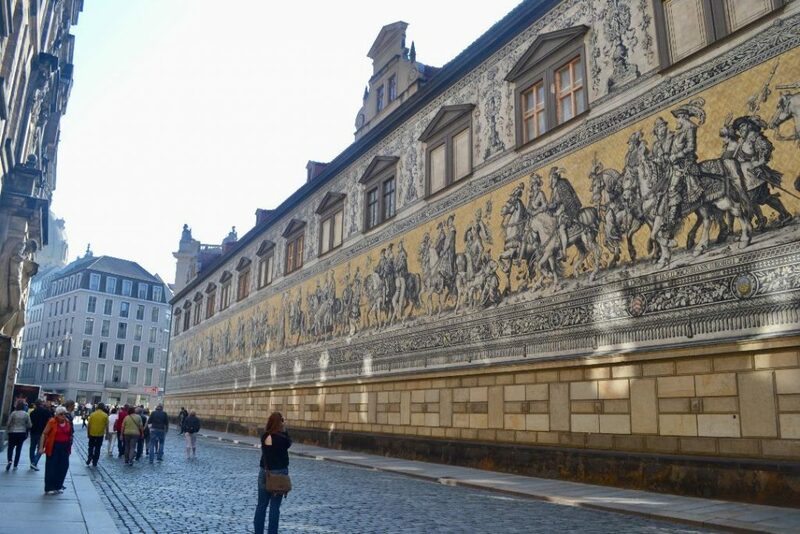 It has, of course, a castle, this one called Dresden Castle, but more amazing to me and most tourists, was this huge mural (done in porcelain tiles) of the Procession of Princes. It was first painted in 1871-1876 and then when it was deteriorating they redid it, in these porcelain tiles (1904-1907). 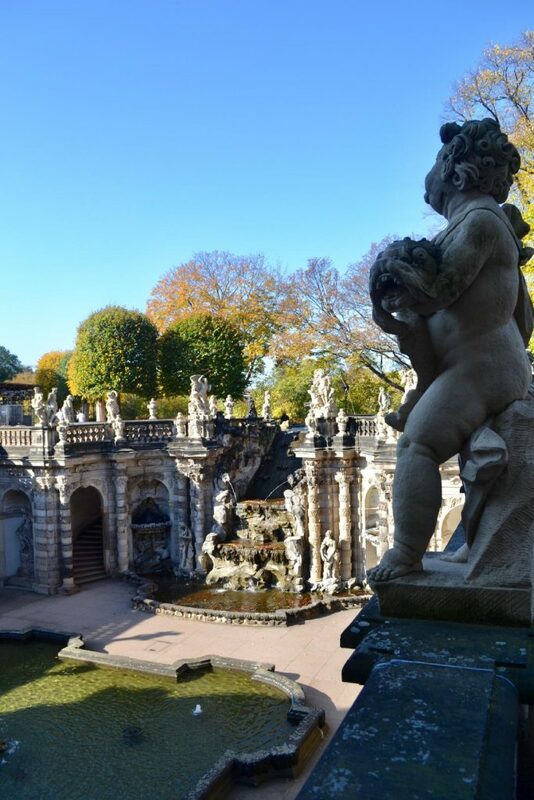 There is also a huge church, Frauenruche (Church of our Lady) and the beautiful Zwinger Palace and Fountain. Parts of the fountain were unfortunately under repair, but we did manage to see this portion and get an idea of how stunning it was. 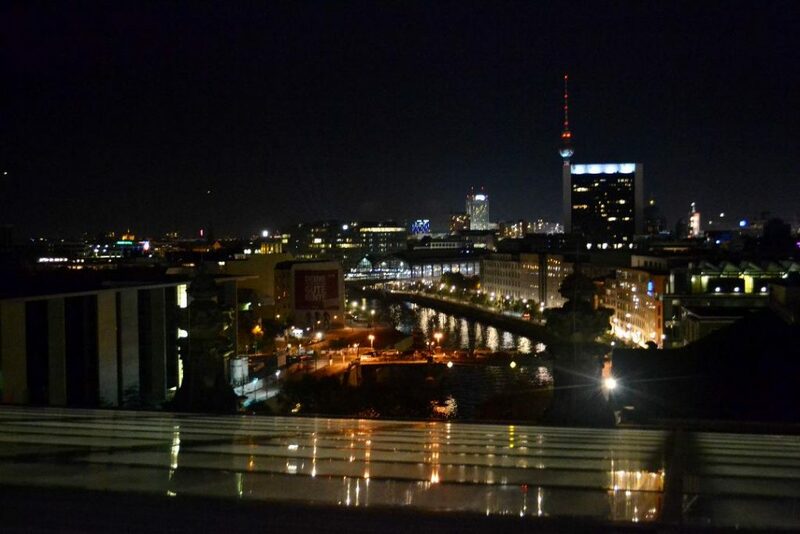 All is all, Germany and especially, Berlin enchanted me and I’d definitely return, in a heartbeat. 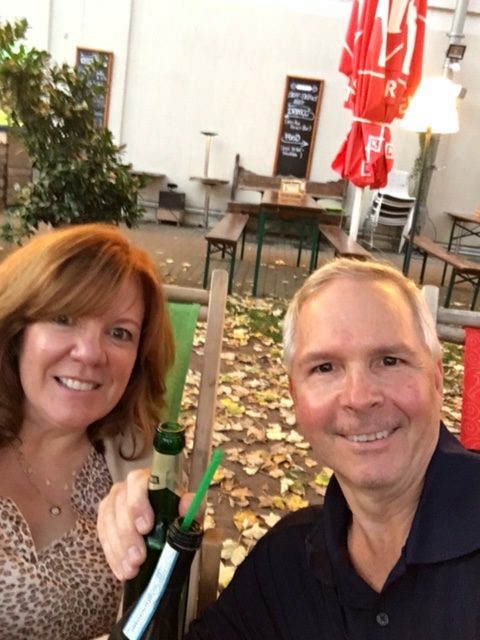 We just got back from an European trip and it was soooo wonderful. 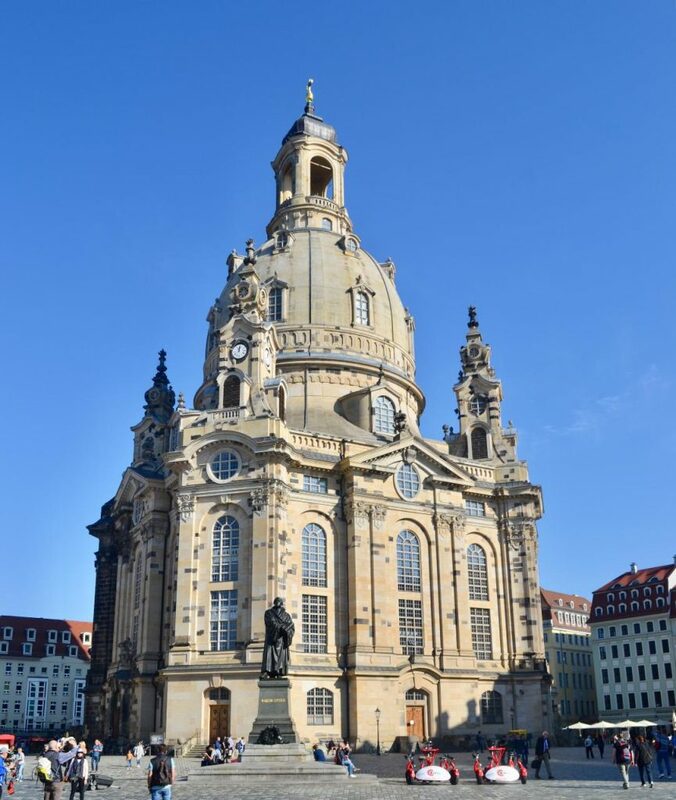 I love Europe, it’s history, it’s old, interesting buildings, streets and I would happily travel there every year. We travelled via a bus tour, our first time and it was really great. No worrying about schedules (someone else did that for us), traffic, directions or parking. But we had alot of time on our own, which made us very happy. All in all, it was a very stressless holiday. 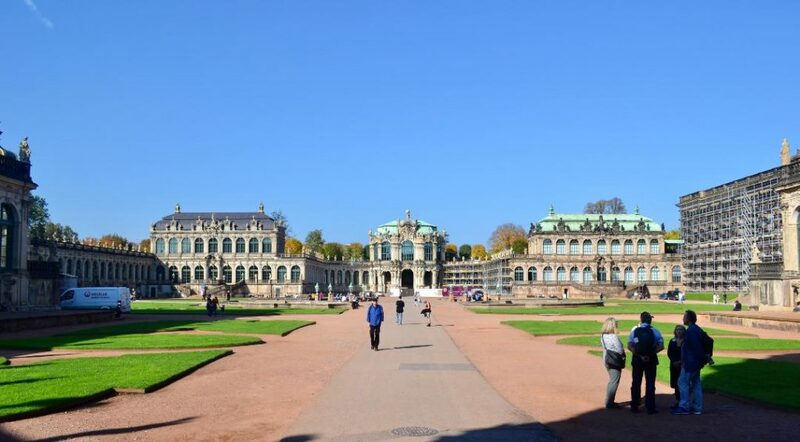 The itinerary was Berlin, Prague, Vienna and Budapest. And with a few town/cities in between the major stops. 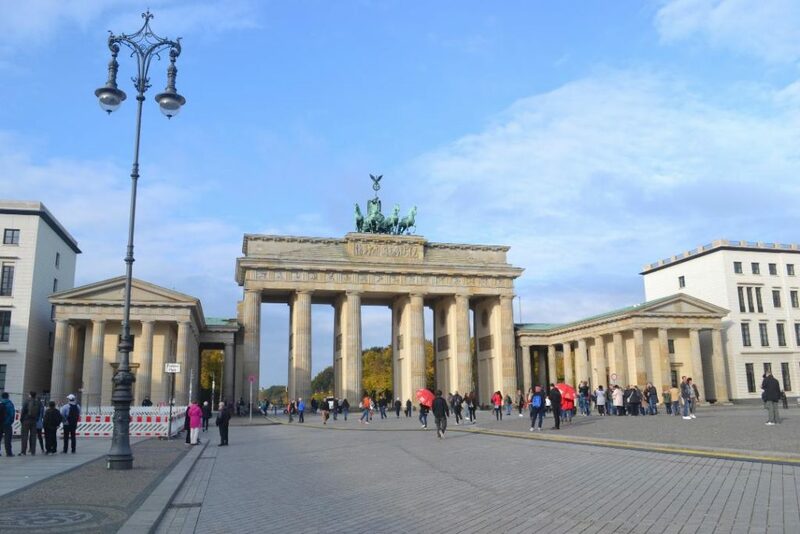 Today, I’m sharing Berlin, which was our first stop and where we stayed for 3 nights. 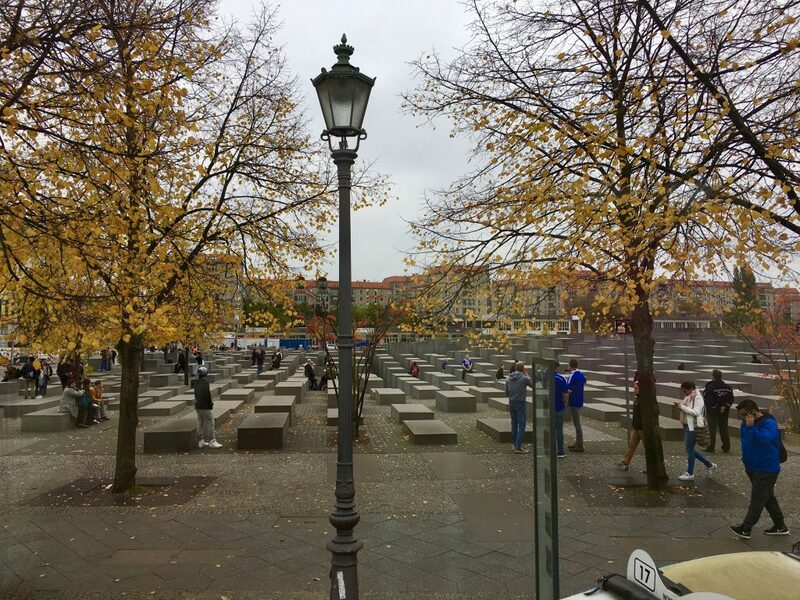 I wasn’t overly excited about visiting Berlin, but the closer it got, and the more I read about it, the more intrigued I got. I had just finished reading Ken Follett’s series on the WWII, in the summer, so that was a good history refresher for me. We arrived after the loooonnng overnight flight and jumped on our bus to get to our hotel. 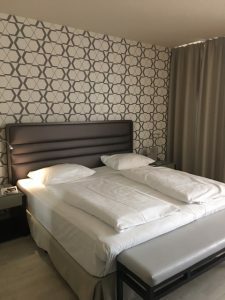 We stayed on the Western side of Berlin and I loved our hotel. 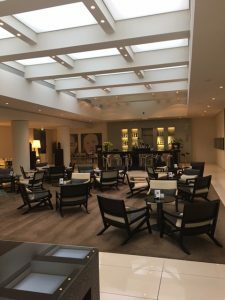 Here’s a few pics from the lobby and our room. 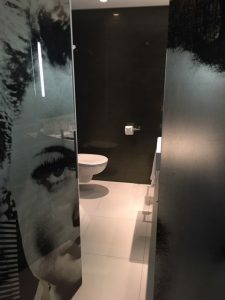 The bathroom was very funky with it’s overscaled art on the glass door. 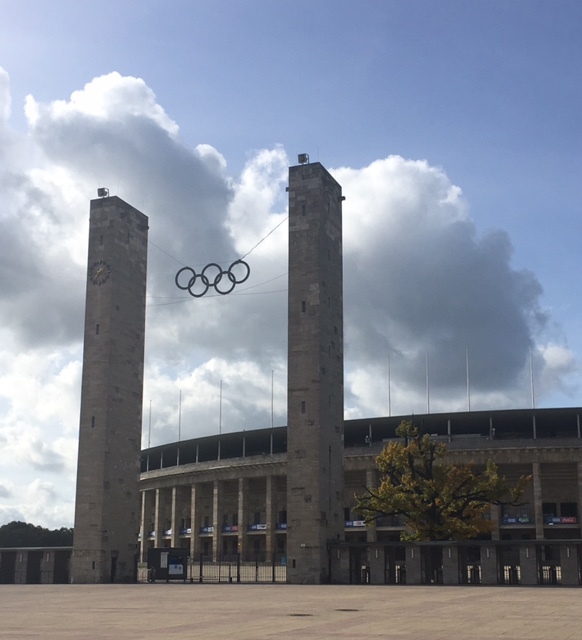 On the way to the hotel, the history lessons started when we stopped at the Olympic Stadium where the 1936 Olympics were held. That night we met up with our fellow travellers for dinner and to get acquainted. The next morning we started off with a bus tour of the city for the morning. 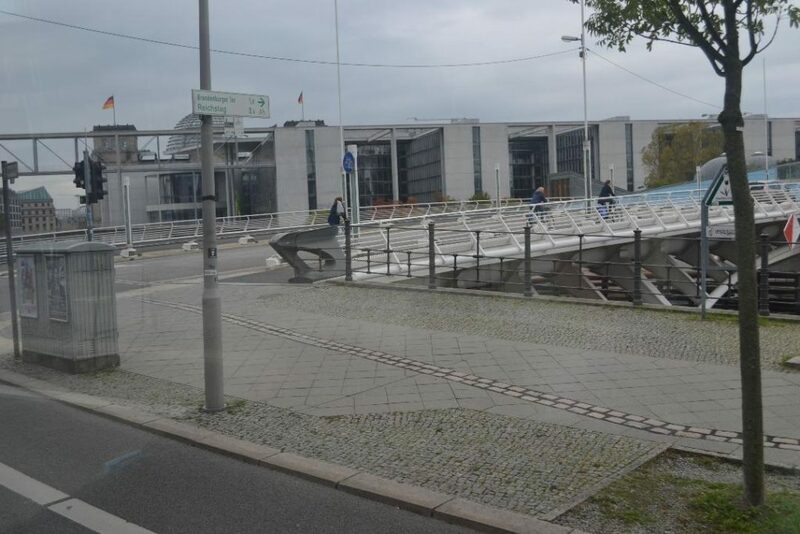 A great way to get your bearings in a new city and we saw the double row of bricks that designate where the Berlin Wall had stood. 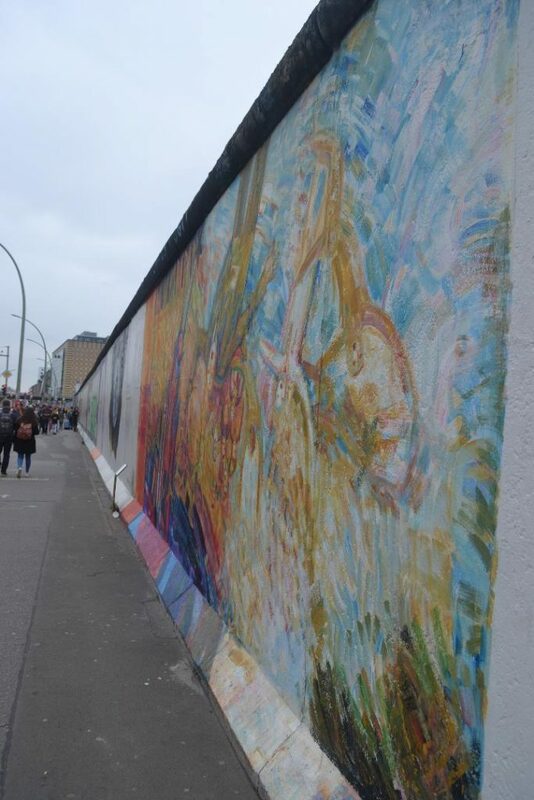 We also walked along the part of the wall that is still standing. 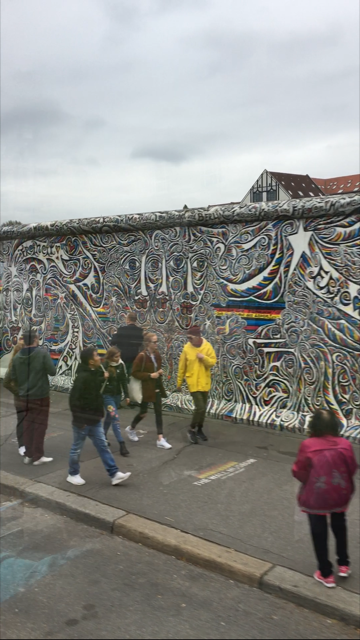 It has been graffitied and beautified by art. 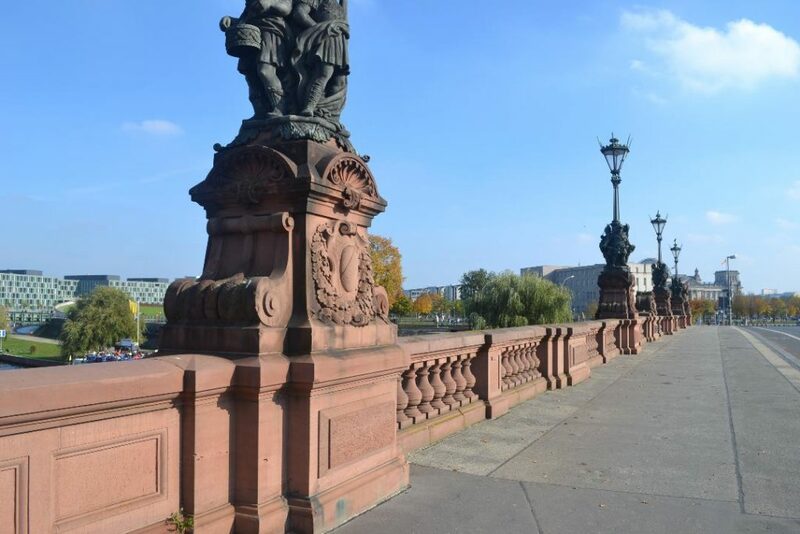 The wall ran pretty much along the side of the Spree river, which divides the city in the two parts. 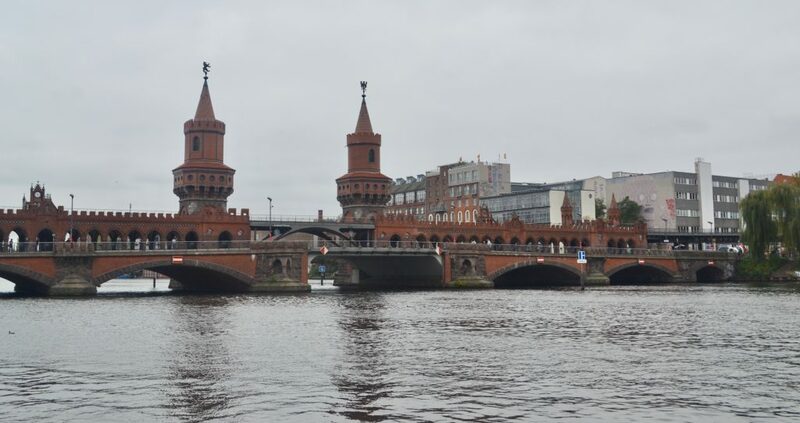 Not far from the remaining parts of the Wall is the Oberbaum Bridge which is an amazing red bricked double deck bridge that crosses the Spree (built in 1894). 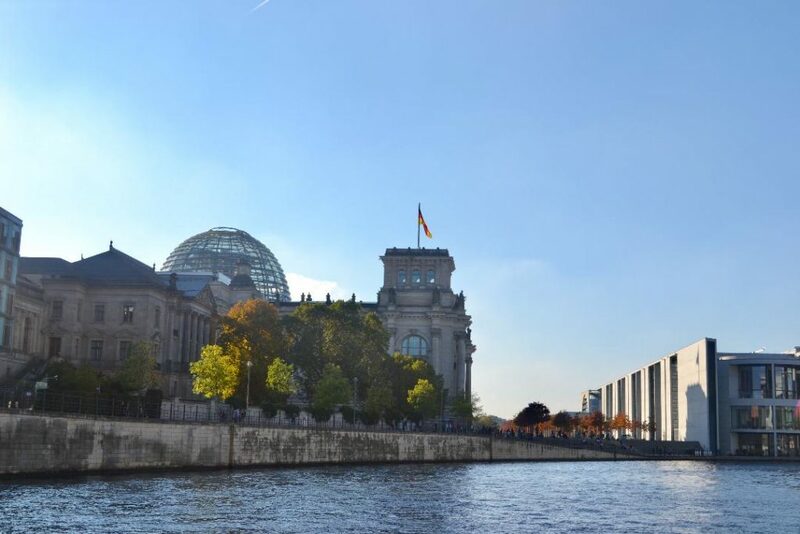 We visited the Brandenburg Gate and saw Bellevue Palace (the residence of the German President) and also Berlin’s Konzerhaus (Concert hall) where a busker was blowing huge bubbles to the delight of many kids and adults. 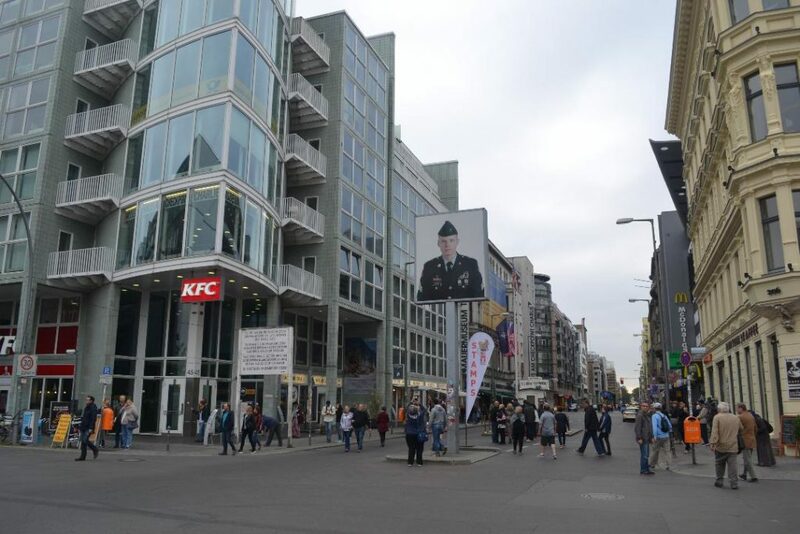 Checkpoint Charlie was another stop and I have to recommend the museum at the checkpoint, it seemed a little small and gimmicky when we first went in, but it actually was huge, it just goes on and on, and we easily could have spent half a day there. 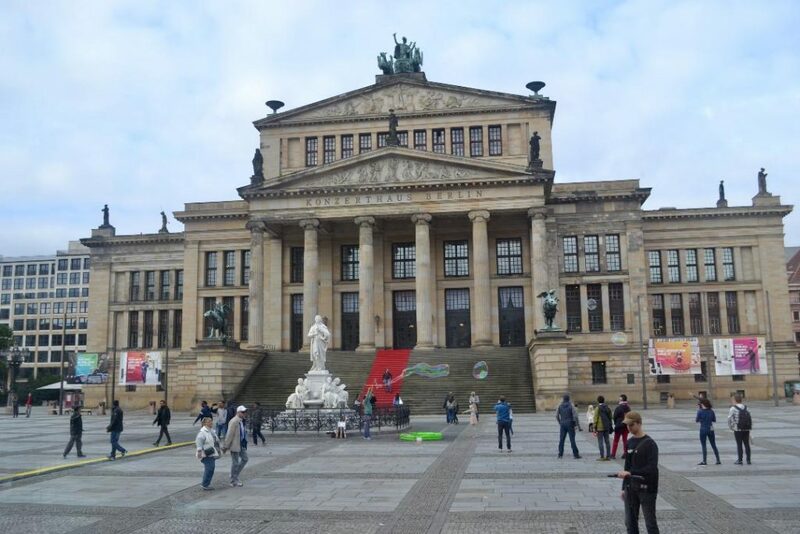 So many stories on how German’s coped during the war and how some managed to escape East Berlin and some that didn’t. 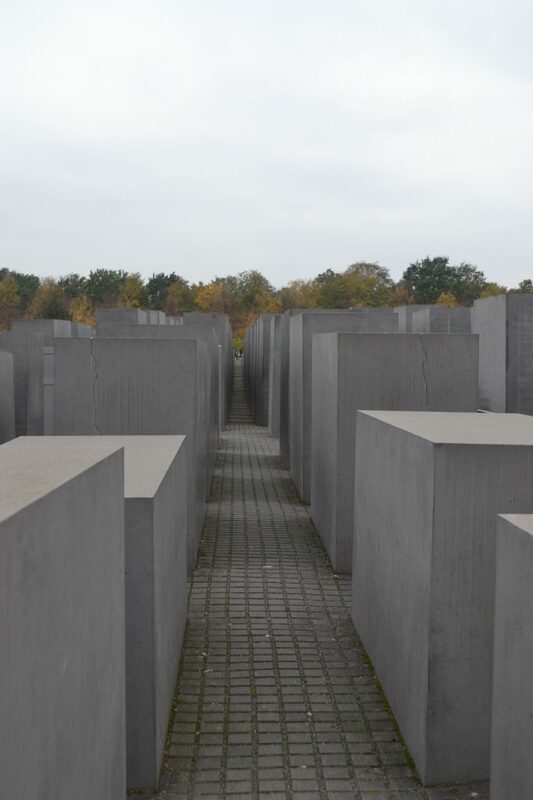 We then visited the Holocaust Monument, (also known as the Memorial to the Murdered Jews of Europe), it is a stark and cold place. The artist did not give any explanation for the monument so we are left to interpret it on our own. I think he meant us to feel stark, cold and alone. The long tunnels and maze like structure were built to allow us to feel what it is like to be caught in a maze and to keep trying to get free and into the light. 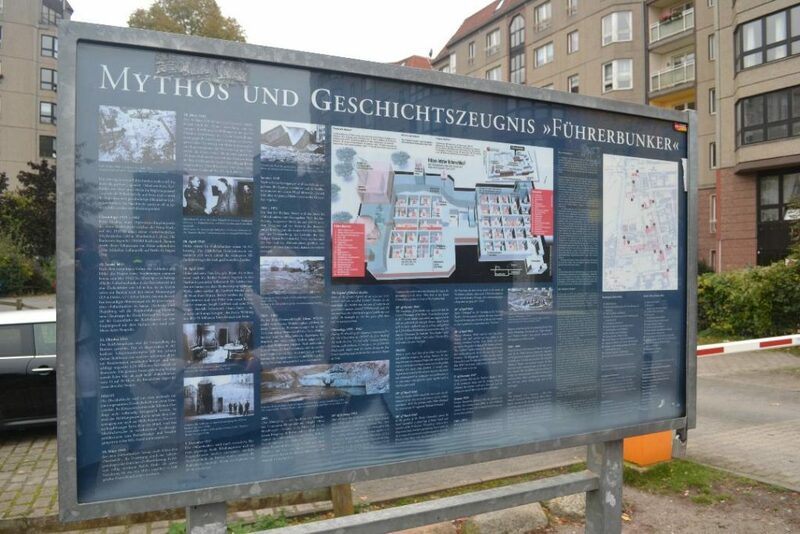 Literally a block and a half away from this monument is the site of Hitler’s bunker, where he committed suicide. There is no building or even a plaque on this site, it is a parking lot. The only way you know it was there is there is a sign describing what had lain beneath the concrete. 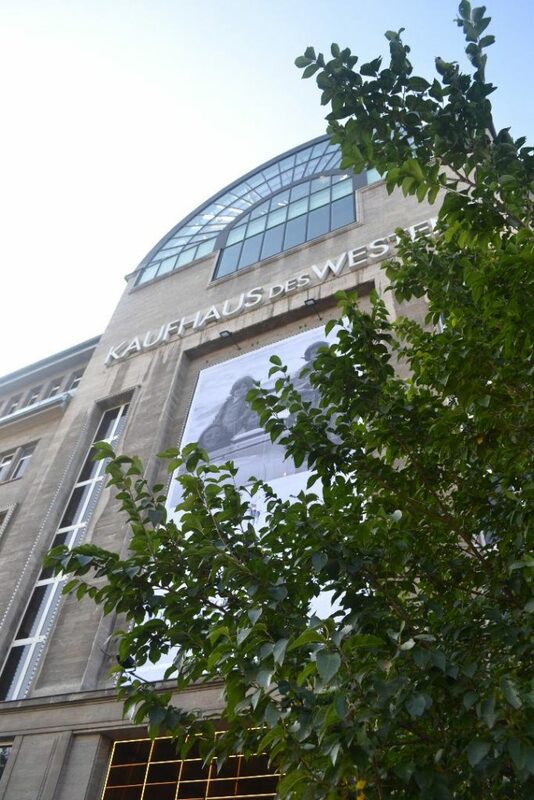 It felt like, Germany has vowed to not let any of these sites become a memorial to him. 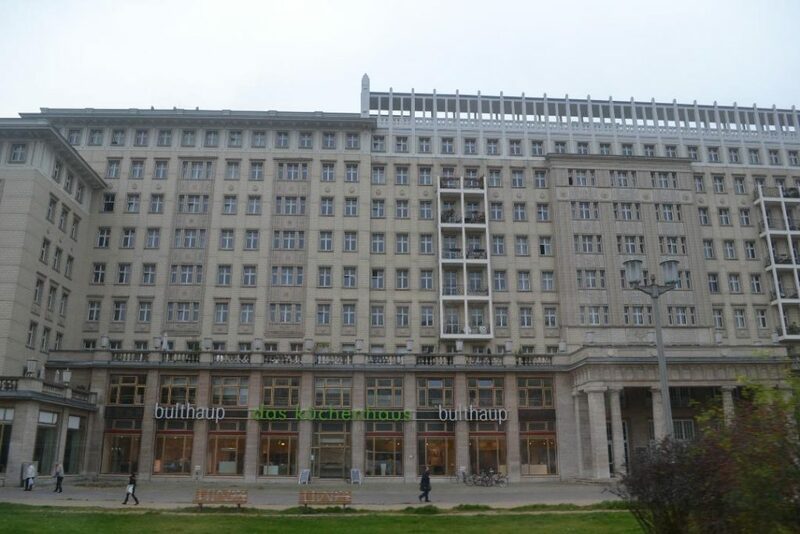 We also went down the huge boulevards that run throughout Berlin and saw typical communist apartment buildings, that were built during the 50’s – 80’s. 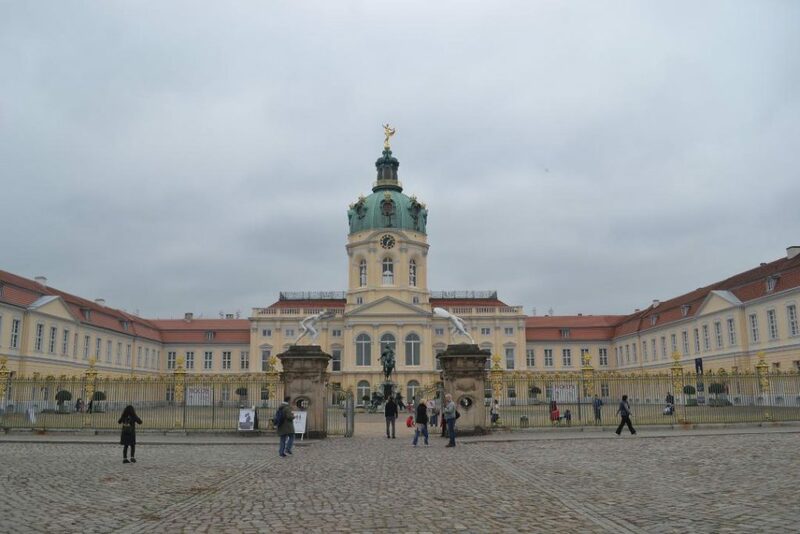 On a lighter note, we also visited Charlottenburg Palace, the German palace that was modelled on Versailles. 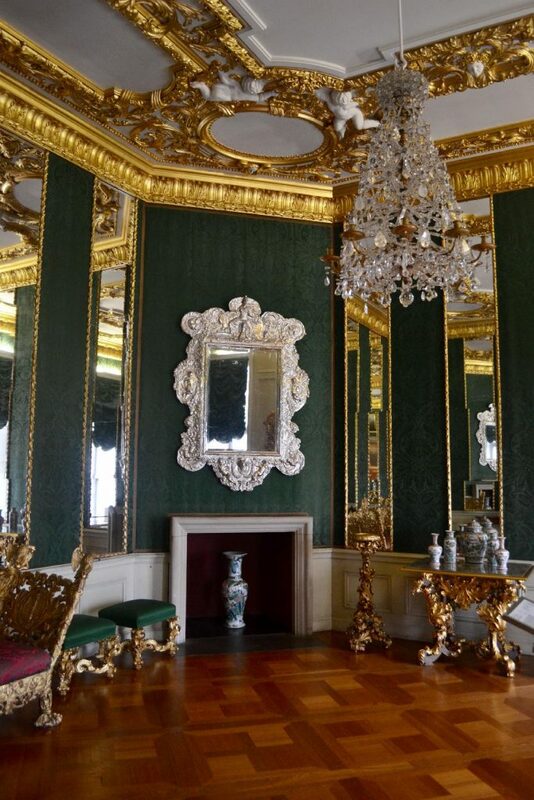 If you’ve been to Versailles, you’ll see the similarities in these pictures. The grounds were also beautiful but at that point, our feet were done, so we didn’t do too much exploring of it. 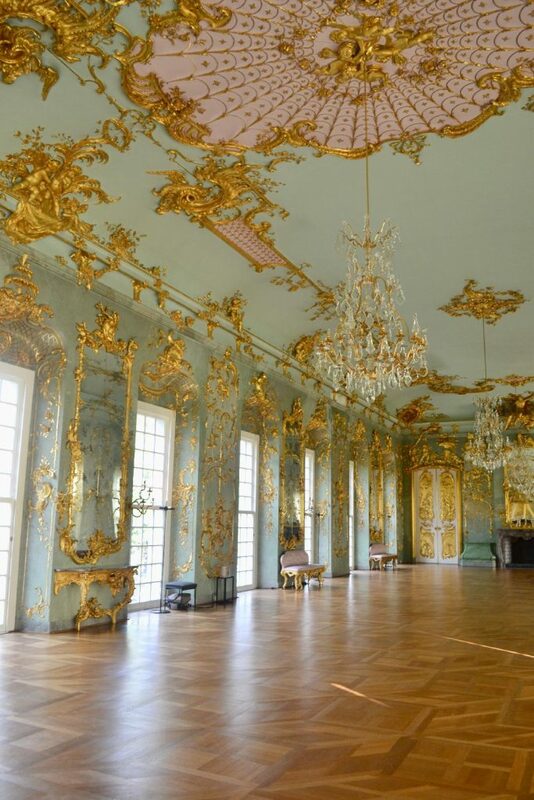 I’m thinking I’ll do a full post on this palace at a later date as the flooring and chandeliers were Ah Mazing! 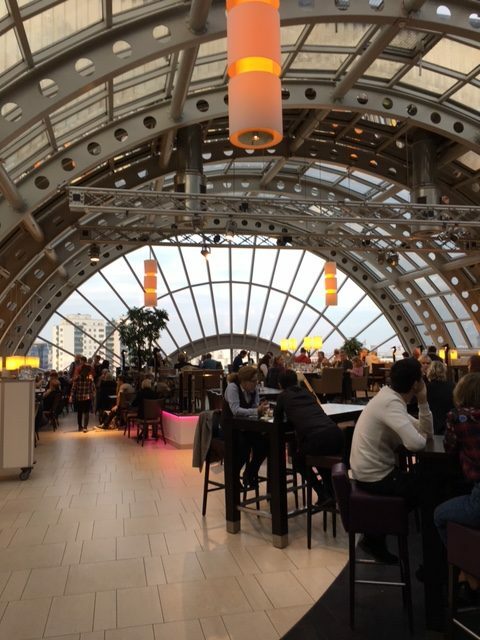 We also stopped into the sixth floor of the KaDeWe mall that is legendary in Europe for it’s amazing selection of any type of food and drink that you could desire. We of course, bought some amazing pastry to enjoy. 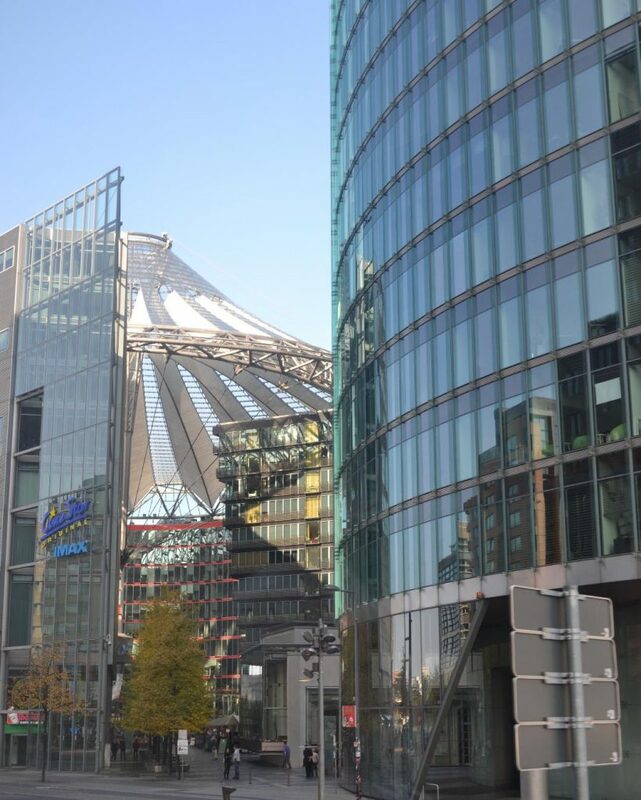 The Sony Centre is another cool sight in a city that doesn’t stop. Did I mention that the bars in Berlin have no closing hours and also you can walk along the street with your beer or alcoholic drink of choice with no issues? It’s definitely a party city for the young and the young at hearts. 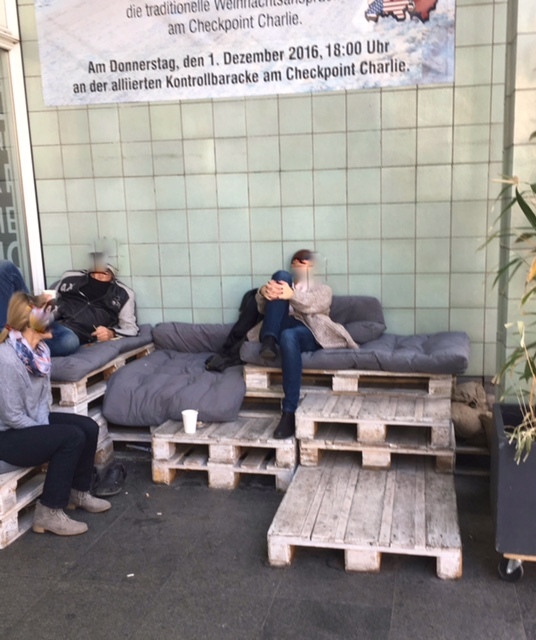 We also saw these crate sofas…. 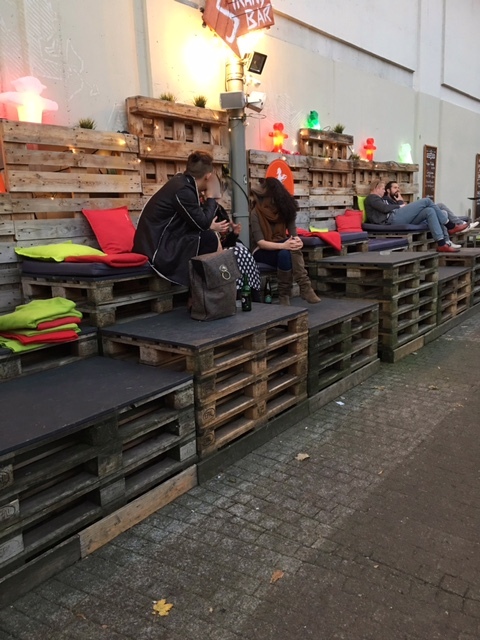 crate beds??? in at least two places in the city. (I’ve blurred out the faces as best I could). 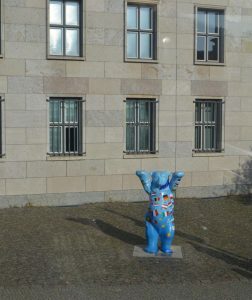 Bears are everywhere, sort of a Germany’s mascot, they are often standing on their heads and are always painted in interesting colours and designs. 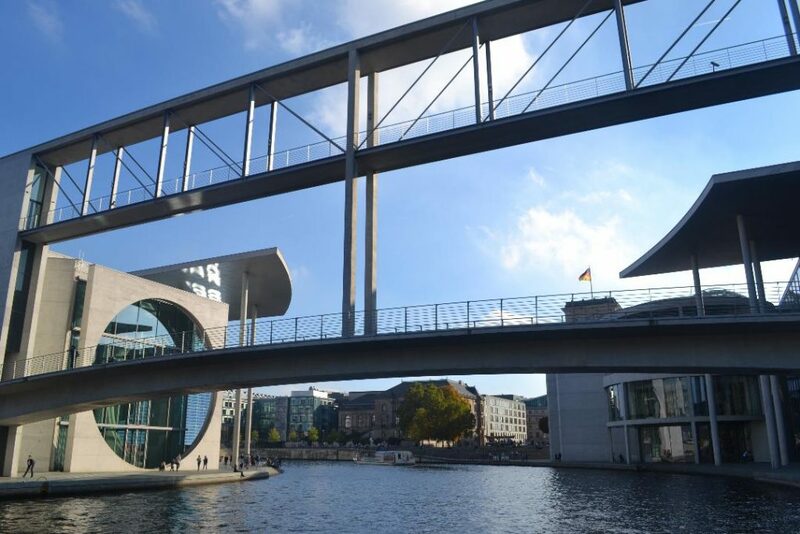 Art and creativity are everywhere in Berlin. 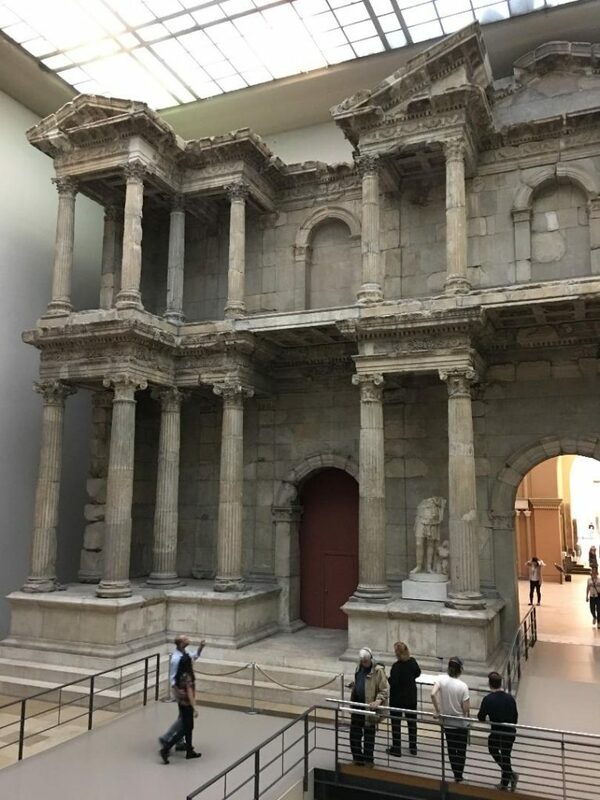 the Market Gate of Miletus, it has reconstructed from the ruins found in the Middle East. 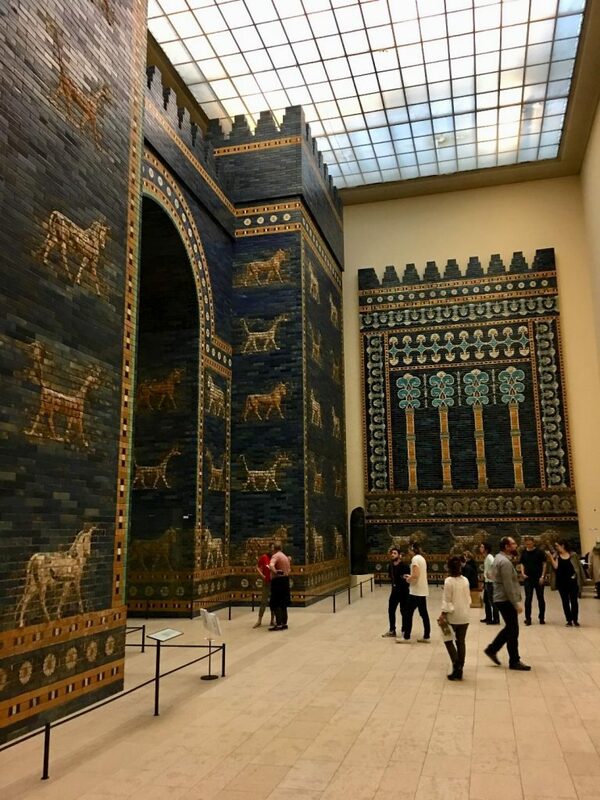 And the Ishtar Gate of Babylon also reconstructed from ruins. The last day we were there we went on a boat cruise on the Spree river and it was a fabulous way to see the city. 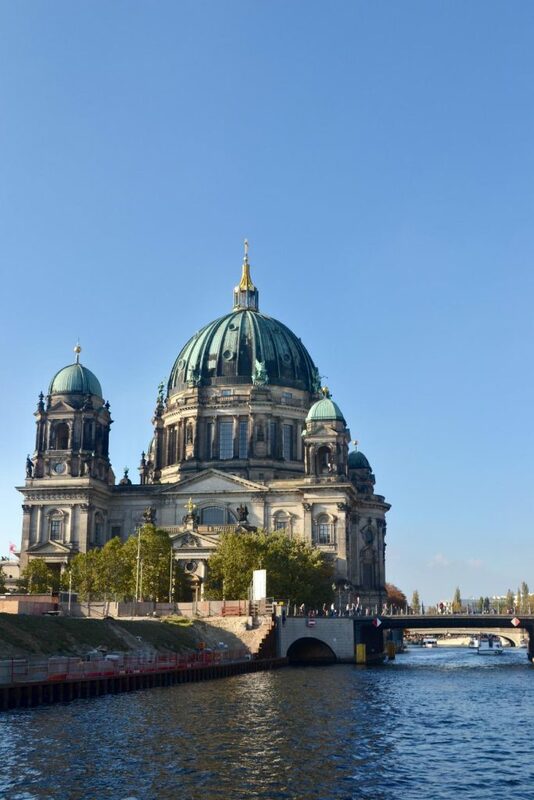 I took way, way too many pictures of the Berlin Cathedral as it was just so photogenic. 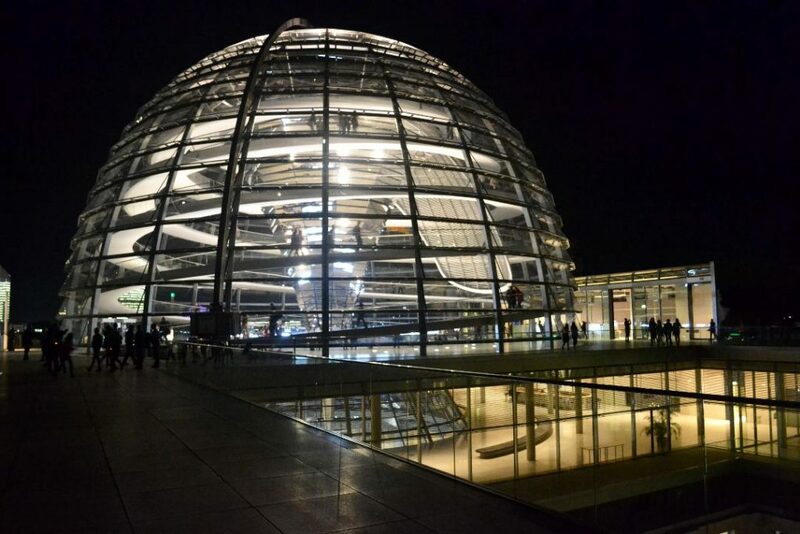 That night we also saw the Reichstag dome. 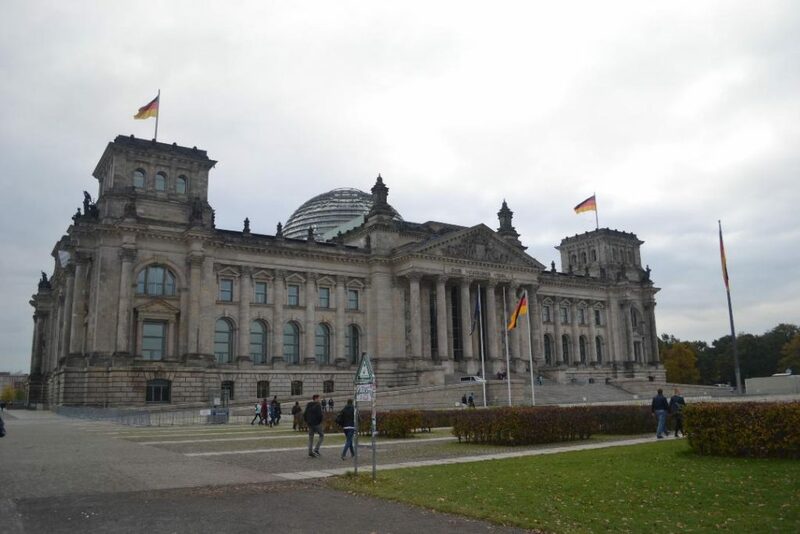 This is the glass dome at the top of their Parliament building. 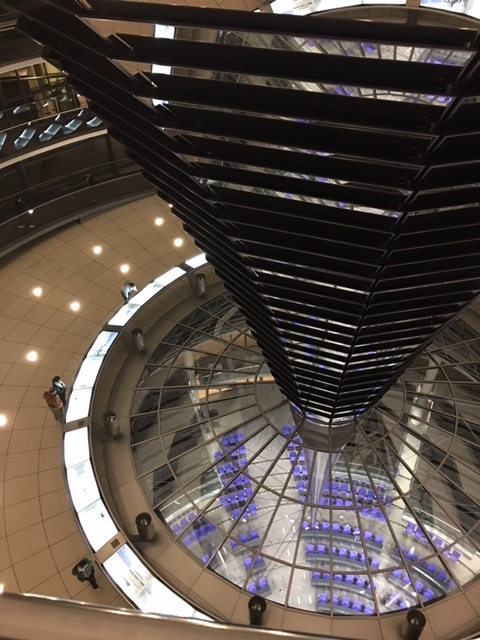 After you get to the top by elevator, you read the history of their government, by circling around the centre column. Once that is done, you can walk up the long, twisting ramp to get to the outdoor viewing area and are treated to an amazing view of the city. It was pretty spectacular to do this at night. The blue seats you see below are their parliament seats. 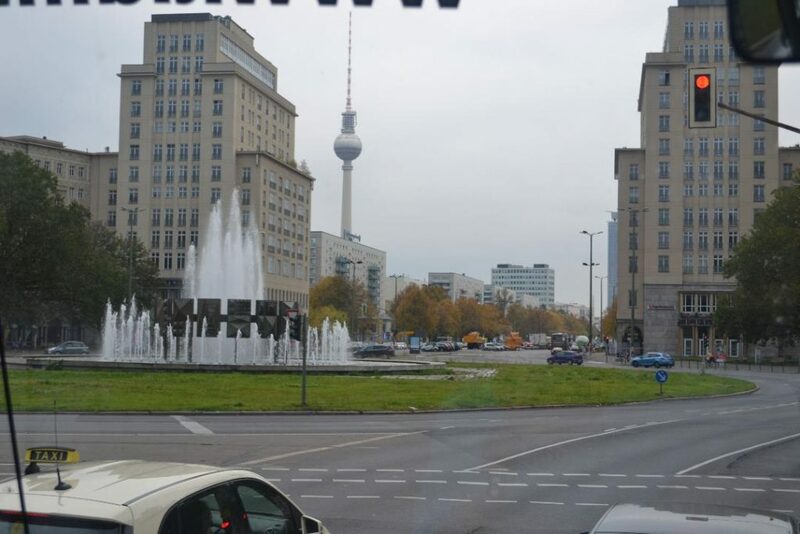 We ate well in Berlin and enjoyed their very welcoming citizens. People were always quick to help and get us going in the right direction when we looked lost. 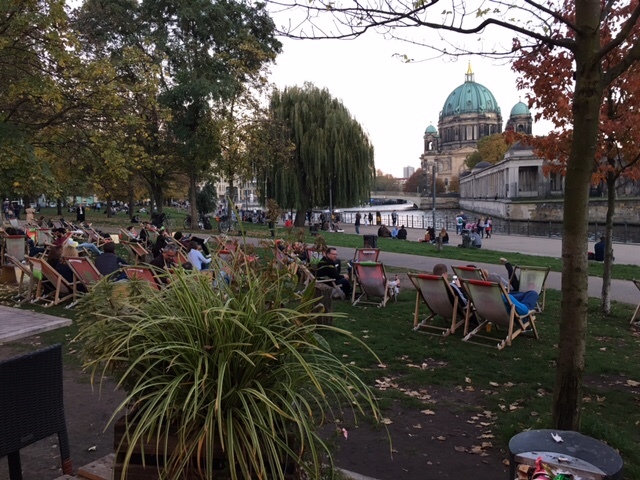 We enjoyed a couple of hours lounging in this very casual and cool bar, right on the side of the Spree river, near the Island Museums, where we were serenaded by talented musicians. I could have happily stayed there for another few hours. And one last beautiful photo of the Cathedral. 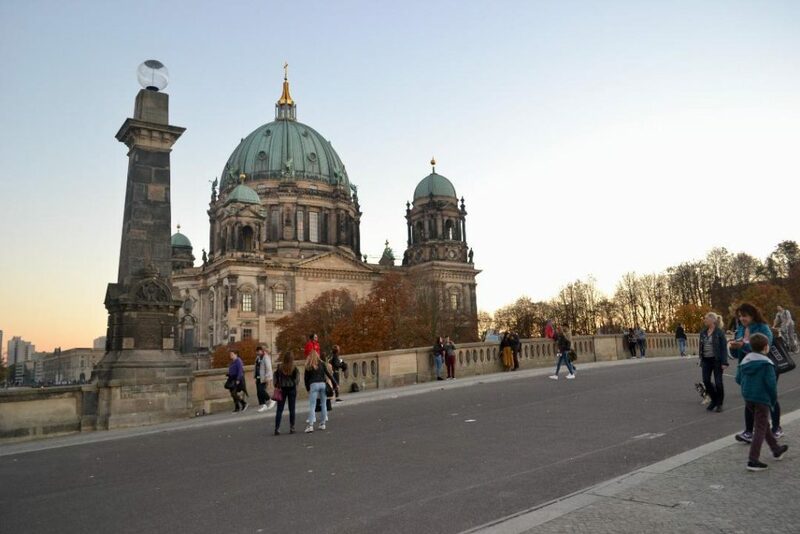 Berlin surprised me with it’s beauty, creativity and history and I’d definitely go back in a heartbeat. So if you get the chance to visit, go. 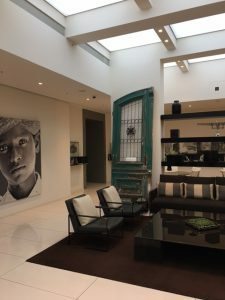 Art – do you frame or stretch? Happy New Year! I hope 2017 is being kind to you so far. It has been wonderful to me. We escaped for a week right after Christmas to Cuba for a little R&R. 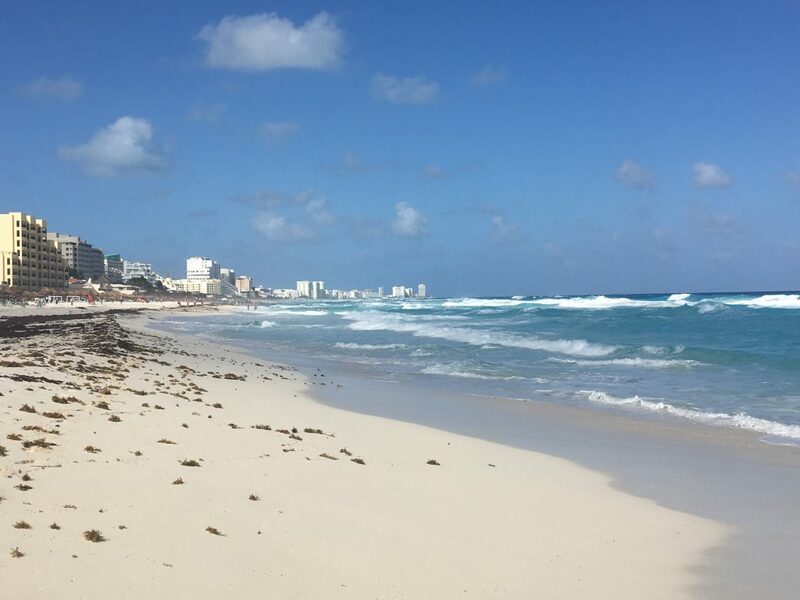 It was wonderful to put my feet in the sand instead of heavy winter boots, even if it was just for a short while. While we were there, we ventured to the Varadero Market to check out some artists. I love to buy pieces of art while we are away to capture the feel and beauty of a country. And Cuba doesn’t disappoint with their many talented and creative artists. 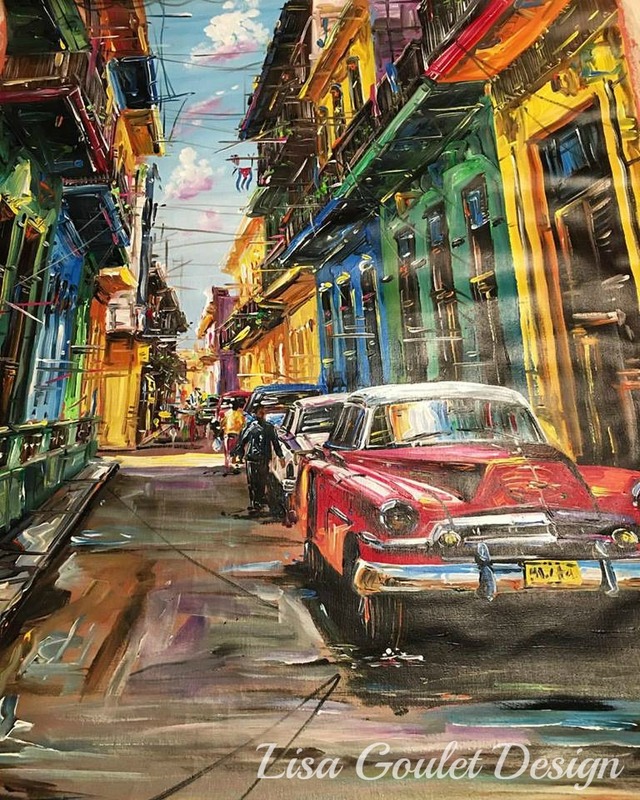 We bought a typical Cuban scene of a colourful street with a 1950’s vintage automobile, of course. The colours are so vibrant, we were smitten at first sight! I’m thinking it will be absolutely stunning in my new navy dining room. 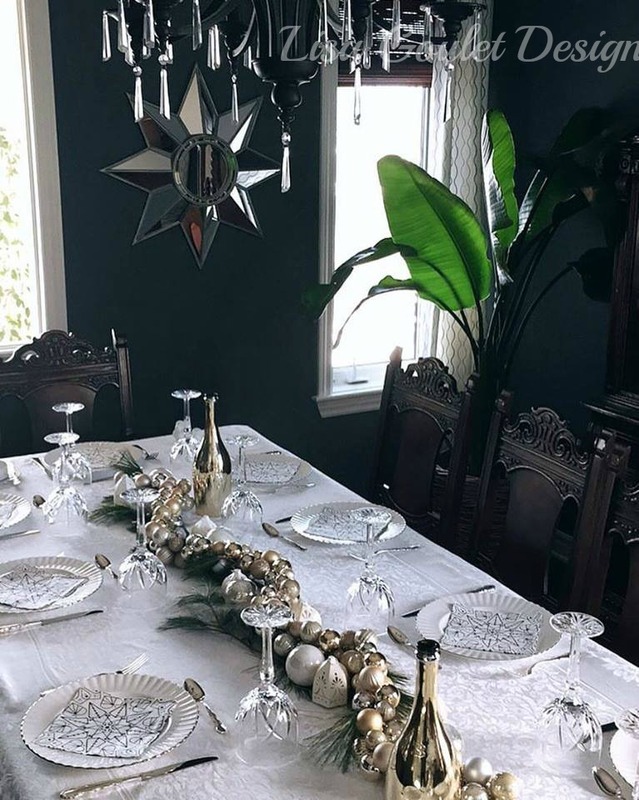 Here’s a picture my son in law took on Christmas day of my holiday table, below. So now how to finish it? Do I stretch and frame or just simply stretch it? Well, I put the question to my followers on FB and the response was overwhelmingly to have it stretched. But I guess, I don’t follow advice too well, as I’m having it framed. My reasons are because the dining room is more formal so a frame feels right but actually, the artwork made my decision fairly easy. As you will see in the photo below. Do you see how the terra cotta colour is kind of creeping out of the edges of the paint on the sides and bottom? It would look really unfinished if you could see that on the sides of it once it was on the wall. You could paint the sides I suppose as I have other mounted pieces done that way, but I didn’t want to play with the integrity of the painting. 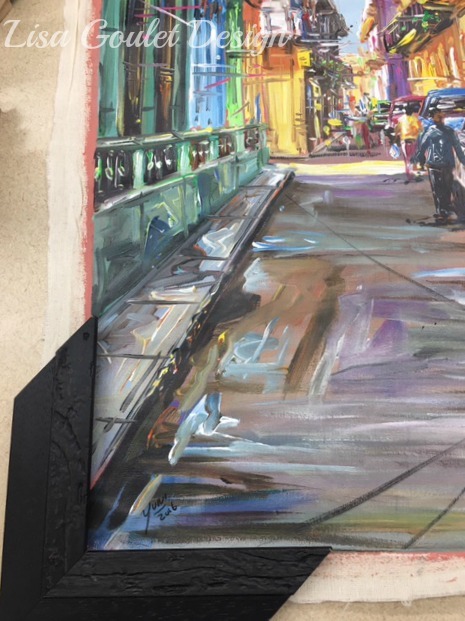 The other option was to still stretch it but to bring the painting over the sides so that there was no unfinished sides but then I’d lose the artist’s signature and shrink the size of the art. Not what I wanted to do. And there was another plus to having it framed, Michael’s was having a framing sale and if you choose a sale priced frame the cost of the stretching was also on sale. So even though stretching was cheaper, for only slightly more money, it will be stretched and framed. So there you have it, it will be stretched and framed. I decided on no matting as I wanted to keep it relatively simple and clean. I went with the frame in the picture above. It’s a soft black and has a slight texture which gives it a little bit of a rustic feel to it, kind of like the painting itself. Even though, it’s going in my dining room, I didn’t want it to be too formal and I certainly didn’t want a busy frame as the painting has alot going on. I wanted the piece to shine out of the frame, if that makes any sense. So sorry, to those of you who voted for stretching only. I’ll post a picture once it’s done and in place and you can see what you think.